Client Name: Fugro Geotechnical Services Ltd. 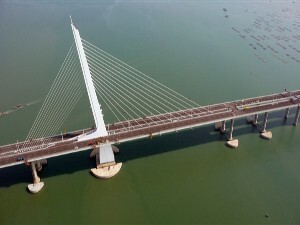 Location: On the Shenzhen Western Corridor bridge connecting Hong Kong to the mainland. Project Description: IRD designed, manufactured, supplied, tested and commissioned two (2) complete sets of dynamic WIM (weigh-in-motion) systems. Each set included three lanes of double threshold PAT bending plate with two loops per lane. Both WIM systems consist of three lanes of double threshold PAT bending plate with two loops per lane. The sensors are terminated to DAW 100 WIM electronics housed in weather proof, roadside cabinets. The WIMs were integrated with the Fugro data acquisition system. IRD has provided Fugro with the DAW 100 interface and suppored Fugro, on a technical level, with the integration. The IRD software was written to accommodate a double threshold bending plate configuration.